The final tournament of the season, in blazing sunshine, was hosted by Tonbridge. The group was tough, with a number of Tandridge league sides from the A and B divisions, as well as some Arsenal development squads. There were 7 Jets flying, with Toby, Matt and Woody away for the day. The first game was goalless, but not without chances, but the Jets found their stride in game two after Nathan’s brilliant opener, as he came up from the back, and cut inside to finish. In the second half Angus sent Todd away to score, than added his own goal with a fine header from a George free kick. Next up were Arsenal ‘south’ who were undone by two excellent striker’s goals from Todd. In a group of 8 teams it was obvious wins were at a significant premium over draws, so an ugly 1-0 was worth as much as the subsequent 4-1, both against Tonbridge sides, most notable for Eddie’s first goal, a penalty that crept in the corner. This led on to a third Tonbridge side, the Angels, with qualification likely at stake. In a controlled performance the Jets led at half time through a George penalty and an own goal; not a pretty way to win, but George solved that with a fine third which underlined things. Safely qualified the opportunity was there to rest and rotate players in the last match. Nathan took a turn in goal, Harry came out for some exercise, both Mattchewy and Eddie got a fuller shift, and Todd still managed a hat-trick, despite being sent to centre back, primarily because Mattchewy declined to score his first goal from a yard out! 5-0 was a fine way to win the group, and Angus’ solo goal also deserves a mention. So, on to the knockout stages, and another Arsenal squad, who were undone by classic breakaway finishing from an on-fire Todd, who helped himself to a hat-trick of the top order. The semi final versus Eastbourne was harder, but Nathan won it with an excellent team goal, and Harry was largely untroubled at the back, until a foolish defensive error left him exposed, and he was forced to save the day. All of which led to a seventh final in seven tournaments. A dominant first half against the EGFA Eagles saw the Jets do everything but score. Nathan managed to get the ball over the bar from a yard out, then Angus beat everyone with a shot…..except Todd who it struck on the line! The second half saw Todd come close, but we went to sudden death extra time, where the pattern continued, as Angus scraped the bar with the potential match winner. EGFA broke back, and were denied by a great save from Harry, which made penalties look inevitable. But a throw in error left Nathan stranded upfield, and EGFA broke efficiently to nick the game. A lesson learned, that good teams punish errors. Overall it was an excellent day’s work. In fierce heat George and Angus outran all opponents, regularly feeding Todd the chances he is so good at converting. Nathan controlled defence, then proved devastating going forward. Mattchew and Eddie shared a role with great heart, and growing understanding of what was required. The football was good enough to attract some generous praise from onlookers, and there was much to be proud of and build on. Thanks to all the enthusiastic supporters, and happy holidays! The Broad Oak fiesta saw a very different looking Jets side as they welcomed two debutants, Matthew L and Eddy J, who lined up alongside Woody (feeling like a veteran after 2 fiestas already) plus Angus, Toby, and the ever present Todd. They also fielded caretaker manager Jim so there were plenty of available excuses if unfamiliarity impacted the performances. The intent was to manage expectations and put the emphasis on team building, but it seemed like winning momentum was infectious as Wadhurst were beaten 3 nil in the opener on the back of a Todd goal and an Angus brace fed by Todd who is developing the knack of being goal supplier too. The newcomers had been encouraged to be cautious and defensive, but such a great start allowed them to get stuck in and play. Broad Oak followed, in a robust encounter where the boys showed no inclination to be pushed around, and they earned a draw against difficult opposition. Next up were the friendly foes of Foresters; the opposition were familiar to the Jets, even if they themselves were puzzled to see new faces in the Jets line up. This made a 2 nil win all the more impressive. Matthew L nullified the strong Foresters’ goal threat, Eddy defended decisively, whilst Woody was a thorn in the side down the left, creating the first goal for Todd, who turned provider down the right for Angus to finish the game off. Outstanding! Two goalless draws followed that might have been wins, which was frustrating, and it was hard work to beat Tonbridge care of a scrambled goal. It had all become a bit ‘route 1′ and Jim issued a reminder of the need to move the ball earlier, and with more intelligence if the side was to progress. The response was a fine 3 nil win versus Ridgeway, with Todd on a mission. Ably supported he helped himself to a hat-trick, and other goals almost followed. The group stages were done: 4 wins, 3 draws, none conceded, job done, semi-finals…. In the semi final the ‘other’ Pevensey side were hungry and closed down the Jets’ passing game. Eddie made a goal saving tackle to keep things level at half-time, and in the second half as Pevensey pressed down the hill, but then over-pressed, being caught on the break by the deadly Todd. That looked to have settled it but in phantom injury time Toby was finally beaten by a screamer. It was a momentum killer, a heartbreaker with the potential to deflate, but in extra time the boys rallied themselves and pressed for a winner, Eddy coming close early on. And history repeated as Pevensey pressed down the hill and were again undone by a fast break and goal from the deadly McGlynn. This time the ref blew the whistle on a Jets’ win. One of the best results of the fiesta season. The final saw a Foresters rematch as they had inched past Eastbourne on penalties in the other semi final. Toby kept the Jets in the game then Todd had a shot deflected by their keeper, and nearly scored an exquisite back heel which was saved by the woodwork. In the second half it was the Jets who were caught upfield, and they died by the breakaway sword they had lived by. Time ran out, legs grew heavy, but there was no shame in losing; the rivalry was sporting, and finalists from both sides left smiling, as it should be. Everyone played their part. To put together a totally different line up and go so far is a credit to all the boys, and to manager Jim who was hoarse by the end of the day. It confirms the strength in depth of the squad, and bodes well for moving on to the 9 a side format. 6 fiestas, 6 finals, 49 games 31 wins, 16 draws, 2 losses, 65 goals scored, 14 conceded. Is anyone tired yet? The Jets went into unfamiliar territory at the Spurs training ground – all new opponents, but that meant the Jets were an unknown quantity too. The day marked the debut for George N, who was most welcome. The first game against Leyton Orient Academy was a tough workout. Toby made a fantastic save to keep it level, and despite some basic mistakes that made stopped the Jets flowing Matthew was on hand with a fine finish to secure valuable early points. Game 2 was even harder, as the defence was stretched every which way. Then Todd stole the ball and stole a lead, and came very close to doubling it moments later. As time ticked by the Jets look set to cling on, but a long range effort went past an unsighted Toby for a heartbreak equaliser. The third game was against easier opposition but after Matthew set Todd up for an early goal the compliment was not returned as well as it might have been. Possession did not turn to goals and it was an ugly 1 nil win that brought out the bad cop in Chris in his post-game review. Fortunately lessons were heeded allowing good cop Neil to praise Todd for setting up both Angus and Matthew, before adding two goals of his own in game 4. We won't mention the goal that was conceded (Harry). All this set up a final group game in which the Jets needed a draw to progress against a very good Swanley side. The team set out cautiously, and despite scares, most particularly when Harry and Toby required help from the bar to clear a cross, a draw looked on. Todd was replaced by George N with the intent to see out time, but no-one told George G and Matthew who made a break which ended in George being flattened. As he received treatment behind the goal Matthew banged home the free kick, and the Jets were through. A great achievement given the group strength. More Chingford Ridgeway in the quarters as the Jets played a very controlled and unhurried game. Angus and Harry were defiant at the back, whilst George N was a rock when he came on. The chances didn’t find their way home, so the Jets resorted to penalties, again! 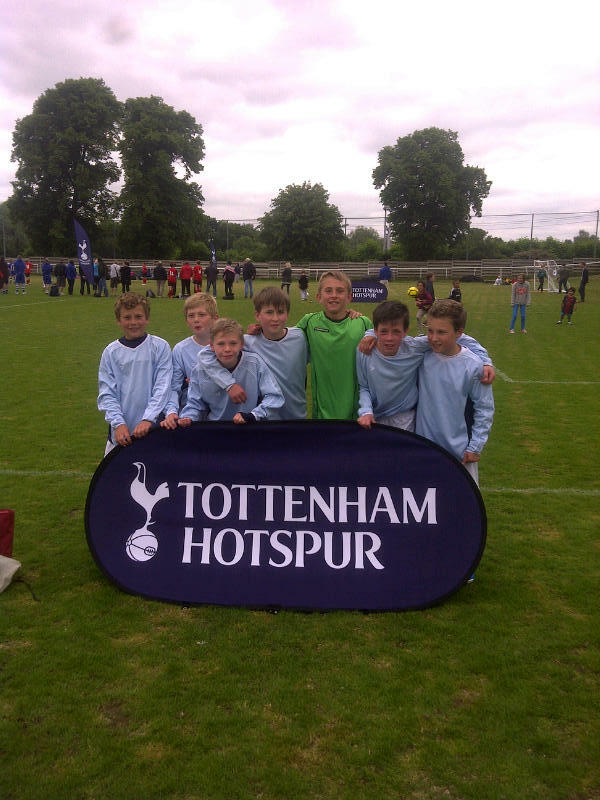 Goals from Matt, George, Todd and Harry plus the usual Toby heroics saw them through to the semi final. Possibly one of the best performances of the season as the Jets overcame the disappointment of losing a lead late in the game, before running out deserved winners. Todd had set them up with a fantastic solo effort, rounding the keeper and rolling the ball into the empty net. A second goal looked set to follow, but with minutes to go a long shot wriggled past Toby for an equaliser that looked set to deflate the boys. But no, Todd escaped his markers, fed George G who had bombed down the wing to hit a hard ball across the face of goal. Matthew arrived late at the far post and crashed home left footed. A late and great winner. Huge credit to the opposition for their sportsmanship at the end of the game; the praise of their coach meant a lot. So, for the 5th time in a row, into a final. Watched by a large crowd, including former Spurs captain Gary Mabbutt both sides were a little cagey. Ridgeway attacked with great speed, but missed the target. On the one occasion they looked set to score Harry produced an incredible last ditch tackle. Up the other end the shooting chances were blocked. Two good teams largely cancelled each other out, the game ending level, as it had in the group stages. Yet more penalties…..Toby brilliantly saved two more, but it wasn’t enough this time, and the Jets died by the sword they had lived by so often in their fiesta season. There was some disappointment but the right response was pride. A lot of people spent the day asking ‘where are you from?’ and ‘why haven’t we heard of you before?’ – They know now, and Langton Green Jets have made their mark. The Jets went back to their roots, at least for some, whilst for others this was a first ‘home’ fiesta of the new era. Either way it was always going to be difficult, with 24 sides competing in a format that gave no room for mistakes, and plenty of pressure given the familiarity of the opposition. The Jets fielded Harry in goal, then Nathan, George, Matthew and Todd, whilst welcoming Woody as a starter in every game. For the 3rd year in a row the first game of the fiesta was Langton versus the Angels. George sat deep with Nathan, with Matthew and Woody supporting Todd. It was Todd who scored to set up what looked a comfortable win until a last minute lapse, when the Jets failed to play to the whistle, and threw 2 points away. The disappointment of that result went up another notch when Harry spilled a goal to Ridgeway. Nothing was clicking; something had to change, and the move made was to put George back in the hub of midfield, return Matthew to the left to complement Todd on the right, and trust Nathan alone at the back, with Woody in an unfamiliar role providing defensive cover. Within minutes Matthew had set George up to pass home a nice equaliser, and when Todd grabbed the lead it looked like normal service had resumed. However a powerful late free kick meant another two points dropped. Crisis? Not quite, but there was a common theme to the draws, being goals give away by a lack of attention to basics. Chris and Neil played good and bad cop (though not necessarily in that order) to preach a return to good fundamentals and early ball movement. With Foresters next up there was no room for any more errors. Matthew scored after 10 seconds, on the end of a crisp kick-off move, which allowed some relaxation, and some rhythm to return. 1-0 looked close but no mistakes were made, and no chances offered; a job well done. After 3 very tough fixtures the Jets let rip against Ashurstwood, and ran in 5 goals, aware that goal difference might be vital in a tough group. Results were going the Jets’ way elsewhere, and they regained control of the group with an excellent 3-0 display against Eastbourne Academy. With a secure lead Nathan was released forward, and he duly added his first goal. This meant only a draw was needed in the final game versus Paddock Wood to qualify. Thankfully Todd and Matthew scored early to ease nerves; the plan then was to rest midfielders, but Harry charitably helped Paddock Wood back into the game, and sent the Jets back to ‘battle formation’. No harm done, and Harry promised he would make amends later. In the end it was a good performance to top such a tough group. Some good sides were eliminated. 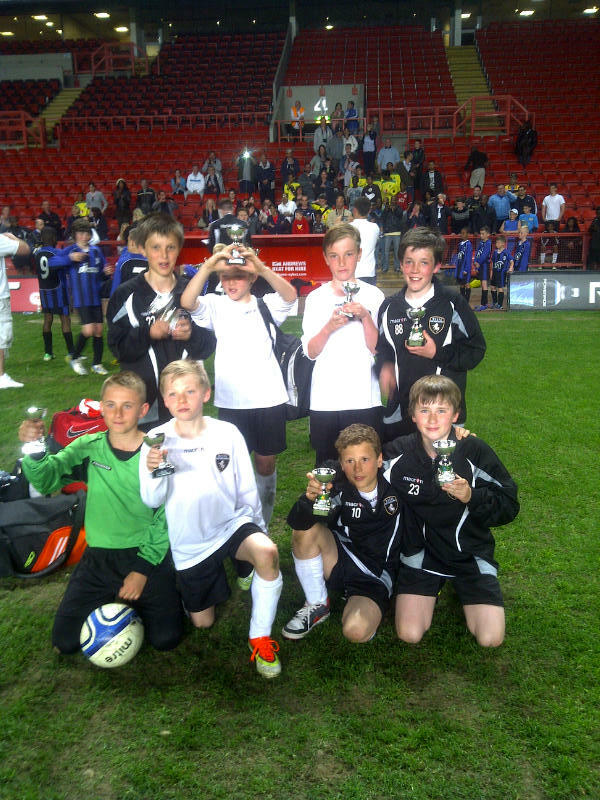 Those who made it to the semi finals were Foresters Red, Tonbridge Angels, and Broad Oak. The Angels arrived in the semi final with a 100% record, but fell to earth demolished by an outstanding display by Todd, who scored 4 goals. Some were the result of opportunistic finishing, some arrived from errors caused by excellent forward pressing with Matthew, some came from teamwork; all were characterised by blistering speed and determination. It was a powerful team performance – semi finals are rarely won 4-0, and the game was over early, with time then to watch Foresters put away Broad Oak on penalties in the other semi final. It was perhaps unsurprising to find so many West Kent District players on both sides of the pitch in the final. The cream had found its way to the top. In some respects this meant the two sides cancelled each other out. Foresters sat deep so had few attacks, but nor did the Jets create clear cut chances from their extra possession. The tension rose as we went to the ‘golden goal’ – ‘next goal’s the winner’, as they say on the playground. It was the Jets who looked set to take advantage as Todd broke clear and approached the Foresters’ goal unopposed. However the Foresters keeper made a fine save and the moment was gone. Time ticked away, and penalties reared their head again. Recent experience at Rusthall meant the atmosphere on the half way line was positive. Harry also had a good vibe from having won the Langton fiesta two years previously with a penalty save in the same goal (and he had promised the team he would redeem his earlier slip). Matthew set the tone with a thumping shot, Foresters equalised, George scored confidently, and again Foresters responded in kind. Todd stopped hearts as his shot crept in off the post- ‘I was aiming at it’ he announced when he rejoined his mates. But, again, back came Foresters, 3-3. Nathan then saw his shot saved; match point….at which moment Harry pulls a brilliant save out the bag to keep his team alive. ‘Deja vu all over again’, as a wise man once said. Meantime Woody was sitting on the ground saying ‘i’m not very good at penalties’ ! Neil decided to have a quiet word and asked if he thought he could hit the ball into the corner. ‘Ok’, he said, so he did, cool as cool gets. Which brings us back to Harry. 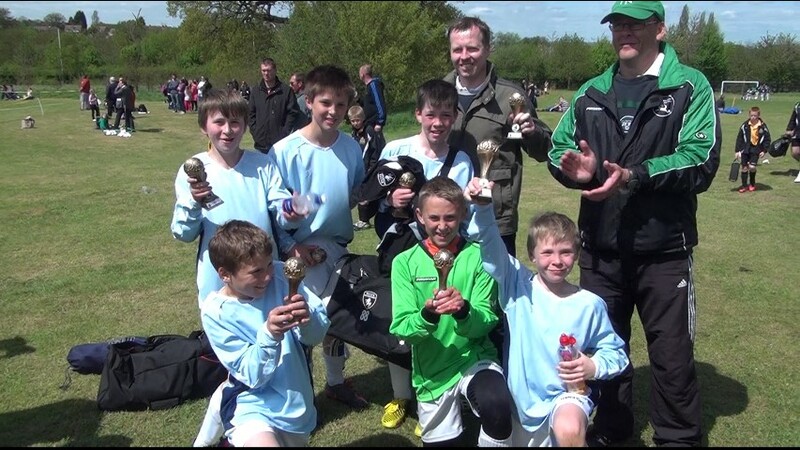 One save away from continuing the Jets’ record of having won the Langton fiesta in every age group so far. And owing his team…..A dive, a save, a debt paid, a hero in green and black stripes. Game over. Jets win. Three fiesta wins in a row, this one like the others a mix of beauty but also of sheer determination, not to mention some brilliant penalty saving. Everyone played their part. Credit must go to Harry, Nathan and Woody for playing so well in roles that required some sacrifice of their normal instincts, as well as to George, Matthew and Todd for doing what they do best. A little credit also to the coaches for changing the formation so early in the tournament and finding the right formula. Finally a massive thanks goes to the supporters – mums, dads, brothers, sisters, grannies and granddads, not to mention friends of all ages, who cheered their heads off every step of the way. A brilliant day, again! The Jets took on a new challenge, playing in a competiton a year above their age group. Physically it was always going to be hard, but the hope was that it would force the boys to try and out-pass rather than out-muscle their opponents. The Jets fielded Toby in goal, Nathan and Harry at the back, George and Matthew in midfield, Todd leading the line, and Woody making his debut as substitute. They got off to a flyer, with Todd setting Matthew up for an early goal against Hastings. The football was good and Woody fitted straight in when he came on. This carried over into a fine performance and a Todd goal to beat Foresters, whilst George wrapped up a win against Ridgeway with a fine goal, and group qualification looked secure. A cautious draw against Ratton Rangers and a scratchy win versus Green Lane kept things ticking over, before a more fluid 2-0 victory over Tonbridge. As usual Todd was prolific; his goal on the turn versus Tonridge probably being the best of his batch. Harry showed that he could keep goal as cover for Toby who had been quietly excellent. The final game saw a lapse in concentration and two silly goals conceded; Woody came on as an extra attacker, and Todd scored two very late goals, one with the last kick of the match, which served to underline the Jets don’t like to lose. Overall it was an excellent group performance. Nathan and Harry were assured and decisive in stopping the opposition, and really dangerous when they broke forward. Few teams possess such great attacking options from the back. George was a rock in the middle, feeding the width provided by Matthew and Todd who presented teams with problems from both pace and dribbling. And it was hugely pleasing to see Woody blend in so quickly; no weak links in a very strong side. A thunderous ¼ final took place against a powerful Cyclones side, with an incredible end. A goal down in a short match it was looking all over and done with. Then the Jets won a late free kick. Matthew smashed it. Todd will tell you he touched it; the one sure thing is that the Cyclones keeper never saw it, and it was game on. Harry produced one of his specialist last ditch tackles, and penalties beckoned. Who would step up? We may never see drama like it again: Matt saw his kick saved, Cylones scored, George’s effort was saved too. In a best of 3 format it meant in effect Tonbridge had 3 match points. Toby saved, brilliantly, to keep his team alive, Todd was cool, scoring under pressure, and then Toby saved again to level matters. But no, the referee demanded a retake; so Toby saved again. He’d save to the left, to the right, and high. Unbelievable! Nathan skied his effort, so Toby had to save the day again; he did. Harry hit the post, and it seemed impossible the Jets could survive again, but Toby parried the shot. All of which meant the Jets had one player left to take a penalty – Toby himself. Sometimes when you want a thing done you just have to do it yourself. He scored, and so for the first time in six penalties Toby didn’t have to save one to keep the Jets in the tournament, but instead had a chance to put them into the semi-final. And with another incredible save he did just that. There are no words to do justice to such a one man show. Both semi-finalists came through on penalties. The Jets had the boost of knowing they had already beaten Foresters, but this was a tight contest, with neither side able to score. Toby kept out a fantastic volley in the first half, whereas Matt put a chance wide just before the final whistle. This meant more penalties, but the Jets were confident in the knowledge their goalkeeper was on fire, and that those that had missed before wouldn’t miss again. Matthew thumped the first one home. Foresters thought they had levelled but had used a substituted player, and Toby saved the retake. George forced his kick home, and then Toby incredibly saved his 8th penalty in a row to put the Jets into the final. The final was more composed than the two previous games but again ended in a draw. Both teams defended capably and the chances that fell were half chances. The Jets started Woody on the right, and saved Todd for the second half, which meant the same boys lined up in the same order for the final shootout: Matthew scored emphatically, and it came as a shock when the Angels equalised. George made it 2-1, only to see it pegged back to 2-2. Todd scored to make it 3-2 and effectively make it match and tournament point. When you have already saved 8 penalties you may as well make it 9, and sure enough Toby did the business. Whoever writes his scripts was testing the bounds of belief, but it really happened; no doubt there will be a movie about it! 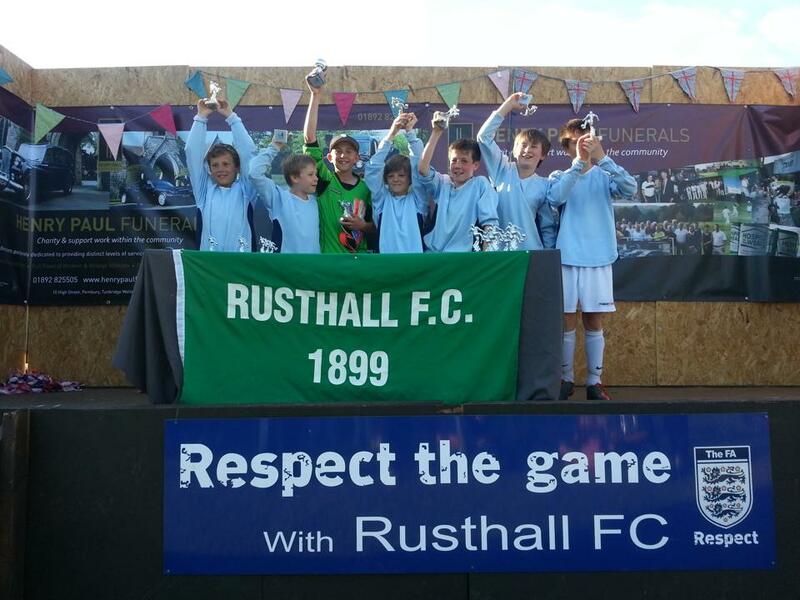 And so the u11 Jets had won the Rusthall u12 fiesta. Sometimes it was with good football, sometimes it took rugged determination. It also took superhuman goalkeeping. No-one had any voice left, never mind finger nails. How Lucy didn’t go into labour no-one knows. Everyone played their part; some days are just meant to be enjoyed. 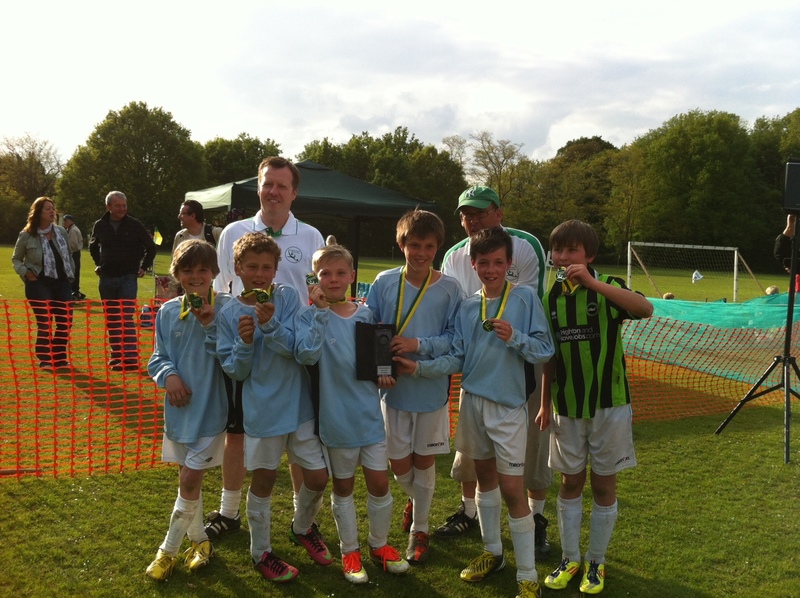 Six Langton Green Jets – Toby, Harry, Nathan, Matthew, George, and Todd – went to Pembury to play on what are probably the best pitches to be found in a local fiesta. The aim was to play from the back, and take advantage of great conditions. They overcame any initial nerves with two early goals from Matthew against Paddock Wood that set a good tone. This sent them into their next game with confidence. The opponents, Tonbridge Angels, represented old adversaries for Toby, Nathan, Harry and Matt, whereas George and Todd had to handle coming up against old team-mates, never easy. They started well, and forced some good saves from the Angels’ keeper before Todd grabbed the lead. Five passes, culminating in Harry feeding Matt to tap in at close range, brought the goal of the day and a comfortable half time lead. The Jets didn’t sit back, and continued to force great saves, particularly to thwart Nathan at the end of a mazy run. In the end 2-0 was the least they deserved. Relief at getting that game out the way perhaps explains how they had a little wobble versus Pembury. A 2-nil lead care of Todd, and a guided finish from George, was halved after a free kick was conceded in a bad area, and for a brief while Toby had to be on alert, but gradually composure was restored. The next match versus Foresters saw Toby’s first serious save, and it was a good one, before the Jets knuckled down and scored their usual two goals, scored, as usual, by the buzzing Todd. By now a good rhythm had been established. Harry and Nathan were combining and communicating well to instigate attacks launched from the back, whilst Todd pulling wide right, and Matthew left was creating space that George was exploiting down the middle. Already qualified for the semi-finals a one-sided goal-less draw ended the group stages – as Neil put it, ‘everyone has a down game in a tournament – you didn’t lose yours’. The Semi-final was effectively over in 3 minutes because by then the two-goal Toad-in-the-hole had done his damage, both goals coming with his left foot. Thereafter the Jets showed maturity in denying Ridgeway possession and a chance to fight back. The only scare came when Harry injured his shoulder. With no sub he was sent up front to keep him safely out the way. But, being Harry, he was taking throws, and making tackles before the end of the game, and demanding to be put back in the middle of the defence. Ridgeway were sporting and gracious in defeat, kind to recognise what a good performance they had come up against. So to the second final for the boys in 6 days. Chris reminded them how little they had liked losing the last one (as if they needed reminding) and out they went to face Maidstone. In a familiar pattern they dominated possession, and had all the chances without luck before half time. Then in the second half George curled a left footer into the top corner, to the background noise of a collective ‘yeeeeeeeessss’ from the sidelines, and it was time to play out the clock. Maidstone were penned in their half, and a first fiesta win for the new look Jets was in the bag. And thoroughly deserved, by players, coaches, and fans, all of whom gave their all. A win is a win, but the pleasing part was the quality of the performances. Onwards…. ‘Into The Valley’ : A new team was born today, as Langton Green welcomed 3 former Tonbridge Angels, George, Todd and Angus, who joined forces with Matthew, Nathan, Harry, Toby, and Charlie, and played under the banner of Langton Angels at the 7 a side tournament held at Charlton Athletics’s ground. The first game saw Langton dominate possession, but adjusting to the pitch and some unfamiliar rules (throw-ins as indirect free kicks) made for few chances. Todd came closest, denied by a great save, and George volleyed just wide at the end. A draw was ok, although the noise from the fans in the stand suggested they had won the World Cup. Games two and three formed a familiar pattern. Lots of hard graft went in to prevent the opposition from even getting down to goalkeeper Toby’s end of the pitch, and then when a goal was scored Todd was rested, George dropped in deeper to help Harry and Nathan, and Angus came on to protect the lead. Harry scored the winner against Kent United White, Todd toed the ball home against Petts Wood. Langton were on a roll. The next game was the toughest on paper, against Kent United Blue, also unbeaten in the group. Almost from the kick-off Todd forced a great save, and Charlie headed the rebound against the post. For the first time all day the defence creaked, but Toby made a fabulous block to keep the game level. Then Todd scored his usual goal (what kind of coach subs a lad every time he scores? ), before Matthew threaded Angus through to put the game to bed. A great win. The last group match was effectively a semi final. Nerves were settled by Todd’s goal, and then Matthew got on the end of a cross to make it safe. Harry and Nathan gave nothing away, Charlie put on a show off fast feet, Angus and George tackled everything that moved. Langton had reached a final in their first outing together. 8.45pm under floodlights, a cup final. The loudest supporters in the land trooped round to the other stand to be closer to the game, and we were off. Everyone gave everything (except the ref who didn’t give much!) but it was only half chances. For a brief moment Langton slept defensively, and were punished; a soft goal. The last 5 minutes saw a siege on the Kent United goal, plenty of scrambles. Then Matt hit the post. The fans roared, the players scrapped, but on this occasion it was not to be. All the applause was hard earned. Players and supporters were exhausted. Chris and Neil had almost no voices left, but they and the boys took time to sit and digest the evening. Much went right and will serve as a springboard. Even the lesson that one mistake can be fatal is a lesson worth taking to the bank. If that was the opening chapter it is going to be a great book. ‘Epic’ in 11 year old speak, I think.